Today we are heading out on our yearly holiday. I can't wait, I look forward to this holiday all year. I've been camping at this same caravan park every January for almost my whole life (Except for the time I spent over East and in the USA, and was so sad to be missing out). My folks have already been down there for two weeks in their caravan, and we are booked in for the next two weeks. It is one of my favourite places in the world, and has such amazing beautiful surroundings! Unfortunately this year because of Joel's recent job change he doesn't get to take the whole time off, so he will be with us for long weekends. But, it isn't like i'll be solo-pregnant parenting, that would be a nightmare! I have my family and friends around, so it will hopefully be more relaxing than being at home! The worst part about camping is the first and the last days! Ugghh, Packing/ Setup and Pack down/ Unpacking. Ever since I can remember my Dad had a camping list, THE LIST... I now make a similar list. Everything gets crossed off, and we leave happily knowing we did not forget any essentials. With a toddler, the list has gotten a lot longer. We will be packing both cars FULL to the brim. Yeah I call it camping, but to some this is definitely Glamping! 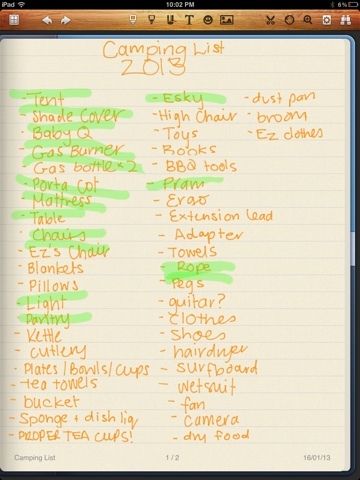 Here's our list... it is long, and I'm sure I probably have forgotten some things... at least I know that my Mum has everything under the sun in the caravan so I'm pretty safe! I wont be blogging too much while were away, but I'll do what I can! !